Visiting with the Alsops, in today’s post. 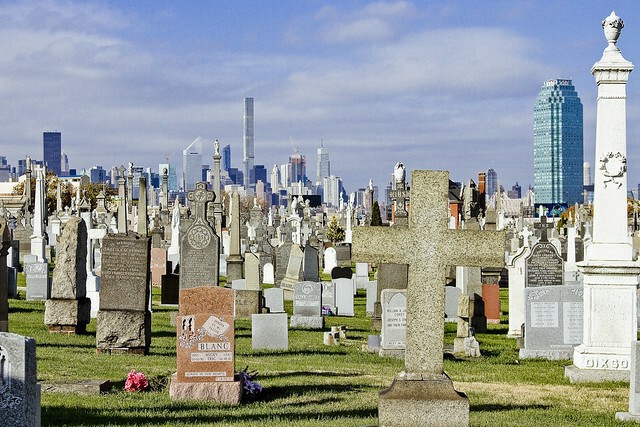 Famously, the Roman Catholic Church purchased the land which would become LIC’s Calvary Cemetery back in 1848 from the Alsop family, who had inhabited it since the time of the Dutch decadence. The first Alsop on the land was a fellow named Thomas Wandell, who had ran afoul of Lord Protector Cromwell back in England and decided his best move was to hide out in the American colonies, specifically the ones which ran the flag of the Staten Generaal up the pole. The property was occupied during the American insurrection by none other than Lord Cornwallis and General Howe, and the experience of the Alsops regarding the forced quartering of troops and the damages inflicted on home and hearth by Hessian and Dragoon alike actually helped inform the Constitution of the United States’s ban on the practice. By 1848, the family line had dispersed and there was only one full blooded Alsop left in Queens. 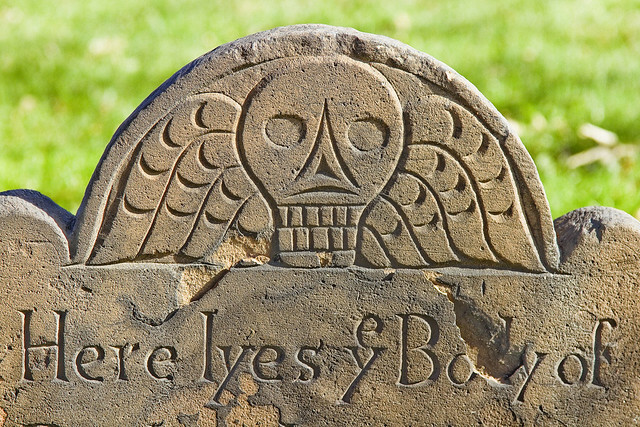 His estate sold the property to the Church, with the provision that the Catholics would maintain – in perpetuity – the Alsop family graveyard within the larger cemetery. 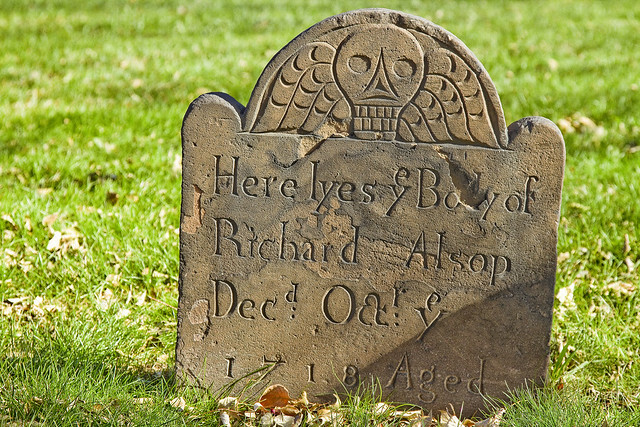 The Alsop plot is a theoretically unique place upon the earth, a Protestant graveyard entirely enclosed within a Catholic one. This doesn’t sound like too big a deal to modern ears, but back in the 1700’s, the Protestant Reformation and the Eighty Years War were still pretty present in people’s minds. The Protestant Reformation, incidentally, is the filter by which one such as myself processes the news of the day. When you’re reading about insurgents and terrorists in the Middle East, it’s hard not to think that “those people” are savages and barbarians. That’s because… well, this post is written in English… Europe’s experience with this sort of thing has sort of faded into the historical firmament. Martin Luther was excommunicated from the Catholic Church back in 1521, which is coincidentally the same period in which Catholic Spain conquered the Mexica Aztec culture and appropriated an enormous quantity of precious metals and wealth from them. Churches in Spain, to this day, have a lot of Mexican silver worked into their ornamentation. What the Spanish Crown did with most of that silver, though, was fund the war against the Protestant crowns who followed Luther into the cold. It’s how they paid for the Spanish Inquistion, and the Counter Reformation, and it’s how Holland and the Netherlands ended up becoming independent countries after fighting their way out of the Hapsburg empires. Europe, for a bit more than a century, was ripped apart by the religious wars. Famine, plague, all that good stuff was the result. Ultimately, the Thirty Years war between 1618 and 1648 ended up killing something like 25-40% of what modernity refers to as Germany. At the end of it, the Crowns of Europe set up authoritarian states which brooked no dissidence and strictly controlled religion, printing, and what we would call “free speech.” The Dutch, and later the English, both began sending their religious zealots to the colonies in the Americas in an effort to try and keep the peace back home. These zealots – Anabaptists, Puritans, Quakers – even Cromwell himself – were considered to be dangerous and it was best to make them go away. The reformation and its wars were bad for business and everyone agreed that a predictable future was better than the inverse, so the Kings grew ever more powerful in the name of stability. Remember too, that 500 years ago, what we know as “Europe” was considered a violent backwater. The royalty were essentially the descendants of inbred motorcycle gangs who had ridden into a city and taken over by force of arms. Death came swiftly for the common people, as any infraction of the rules set down by these undereducated masters incurred reprisals that the ISIS people would be very comfortable with. After the Protestant Reformation’s wars had run their course, Europe entered into a period which is referred to as “the enlightenment” during which the winners of the reformation game consolidated feudal holdings they’d won control over into nation states whose names are familiar to modern ears – France, for instance. The countries which were never burned by the fires of these wars remained feudal duchys of the Catholic Church until quite late in the game – Italy comes to mind. The absolute monarchs who ruled these new “national” territories were tyrants, so much so that the merchant classes of Europe – the so called Bourgeoise – began to pick up stakes and follow the zealots over to the Americas. These Bourgeoise, who were heavily influenced by the Freemasons philosophically, are the people who led the revolutions against the European Monarchs, and the influence of the very conservative Catholic Bishops, and who set about trying to create Nation States which would operate in “rational” and “scientific” ways. What’s happening today in the Middle East is not entirely unlike the Protestant Reformation. The Protestants were religious fundamentalists driven to violent action by tyrannical and unfair governments who were supported by a clergy that supported and reinforced the power of the tyrants – those motorcycle gangs mentioned above. The Spanish empire was ruled by the Hapsburg family, who also controlled what would one day be called the Austro Hungarian Empire but at the time was called the “Holy Roman Empire.” Both Catholic and Protestant militarized and controlled vast resource bases, and when the Spanish hit the jackpot in Mexico – things flew into high gear. Genocide was an official policy back then, and the reason that the Crusades were abandoned wasn’t entirely because of the rising power of the Ottomans. It was because the Crusades were being aimed at the Albigensians and Cathars in France and what we would call Germany. As Americans, we are the inheritors of a particularly Anglophile point of view. The fact that this POV exists at all is because the Spanish Armada never made it to the Thames. For a straight up history of the Alsops, check out this post presented at this – your Newtown Pentacle – back in 2011. Institutional memory is something that I constantly rattle on about. Something has gone wrong with our culture – it just might be Facebook – in recent years. A scandal or tragedy occurs, and everybody acts as if it’s something that’s happening for the first time. Ignorance of history seems willful, which breeds a sense of fatalism on the part of many. The world is not going to hell in a hand basket, rather, it’s been there before. 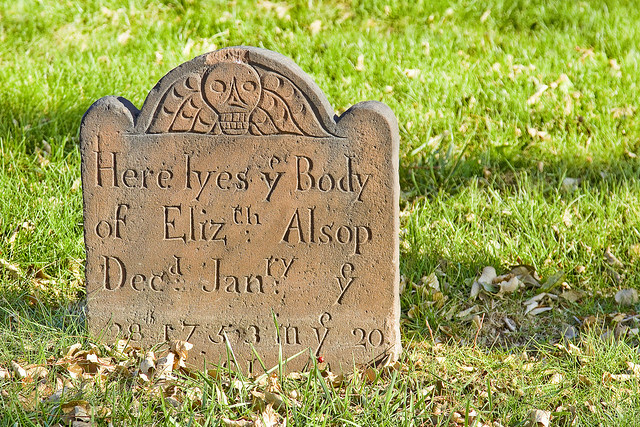 I’ve got to stop hanging out in cemeteries, because places like the Alsop plot are how every story ends. Well said. Enjoying your blog. Keep it coming. Hey Mitch…definitely a lot to chew on here in this latest post. 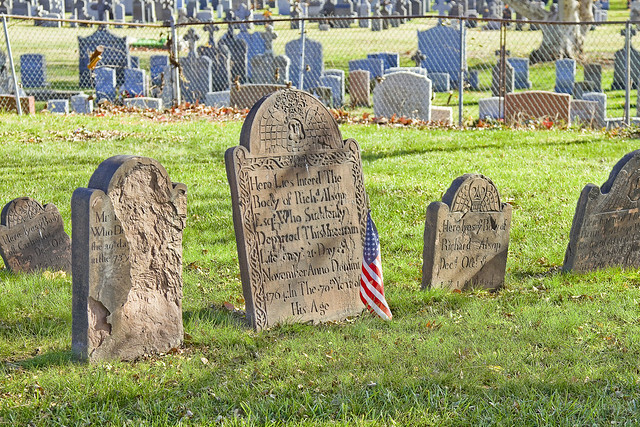 What I’d like to know is why are there so many abbreviations on these old tombstones and why so much of the lettering is “up in the air” above the main line text.